The internets went wild as Twitter feeds flooded with reactions to the two minute tease. The general consensus seems to be overwhelming excitement… My reaction is a little more tempered. While there are certainly some awesome elements, there are quite a few things that concern me. Still I really enjoyed the trailer, but something felt… off at the same time. I decided to give it a few days and watch the trailer a few more dozen times. The trailer begins with like the original teaser for The Phantom Menace, in a very quiet long establishing shot, as our hero, Rey traverses the desert of Jakku on a speeder bike through a ship graveyard. It’s a wonderful moment and evokes a very Star Wars otherworldly feel… we fade to black. Unfortunately the rest of the trailer is hampered by a case of living in the past. While reflecting on the trailer a good couple of days I’ve come to the conclusion that director JJ Abrams is doing his damndest to convince audiences that his new Star Wars film is fresh, while all the time catering to the nostalgia of older fans, and ultimately fails miserably on the first count. The trailer is little more than a 70s/80s retro fest with nearly shot for shot recreations of the Death Star II exhaust port chase, a recreation of a famous publicity shot, and constant call backs to the Original Trilogy. Originally I was going to do a point by point breakdown of different shots, and I may at a later date, but to summarize, there’s a lot in the trailer I really like, but there’s a disturbing tendency on JJ’s part to play it safe and simply cater to fans, and that’s not what the Saga needs right now. What Star Wars needs is a fresh voice with bold ideas who understands what came before and wants to continue telling stories rooted in myth while approaching it from a new angle. Does JJ “Get” Star Wars? What particularly disturbed me about the Celebration Force Awakens kick off panel were comments uttered by Abrams himself which really made me question whether or not he even understood what Lucas was trying to accomplish with the entire Star Wars Saga, let alone the Original Trilogy. At one point Abrams regurgitated the Prequel basher talking point that Star Wars is really at its heart, a Western, which of course implies that Lucas really doesn’t get Star Wars at all and the appeal of the franchise. Somehow, Star Wars is a space Western and if Lucas just would have kept Star Wars limited to that box the Prequels wouldn’t have gone off the rails (so the theory goes). This whole mantra of Star Wars as Western source seems to have begun by a group of Lucas bashers who created, what they call, the “4 Star Wars Rules.” Apparently on some level Abrams subscribes to this theory. 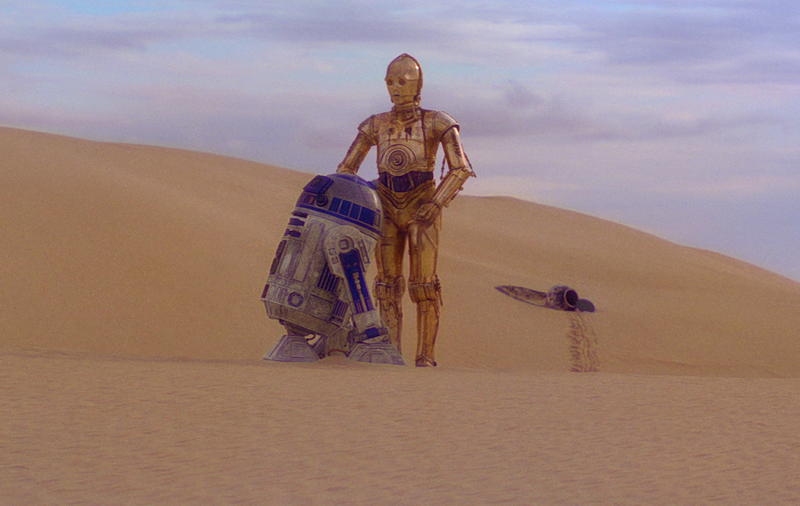 Even the plot of A New Hope has almost nothing to do the Western genre. 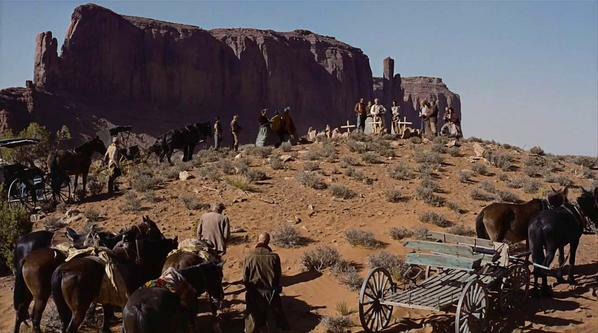 Sure there are elements of the American Western sprinkled throughout; Han is certainly a space cowboy, Mos Eisley, and especially the cantina have a very Western frontier town feel to them, but they are just elements of the whole. A New Hope, like Star Wars in general is an amalgam, a pastiche of the influences of Lucas’ youth and interests as a filmmaker, borrowing heavily from sources such as Flash Gordon, Tolkien, Greek myth, Japanese cinema, Medieval adventure tales, layering it all with a spiritual element gleaned from the world’s major religions. A New Hope has far more in common with Flash Gordon serials (which Lucas originally wanted to adapt) than a Western, and the plot borrows liberally from Akira Kurosawa’s classic samurai film, The Hidden Fortress. Abrams failure to grasp this raises a whole lot of concerns on my part. I’m just not sure he really understands the mythology and legacy behind Star Wars. He certainly understands his feelings of Star Wars as a child, and how that impacted him as a youth, but there’s so much more to the Saga than one’s childhood memories and fantasies. That’s a large reason that while on the one hand I enjoy the trailer immensely, on the other I worry that The Force Awakens will be little more than a nostalgia fest; something Abrams is intimately familiar with. 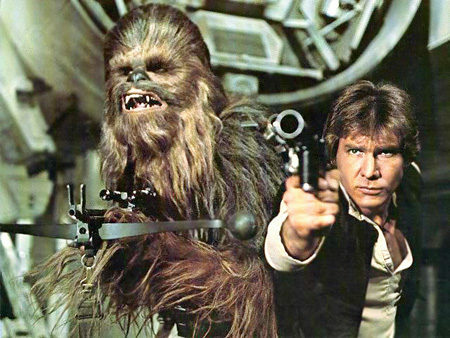 For a lot of fans, the final shot of Han & Chewie aboard the Millennium Falcon was the “money shot” and sent them over the moon as fanboy/fangirl chills ran up their spines. The waves of nostalgia washed over them and they were filled with a sense of awe as their dreams were finally realized… George no longer had his hands in the Saga, all of their wildest Star Wars dreams could be realized. For a brief moment I was even hit with a feeling of being that child who grew up with Star Wars back in 1977, waiting anxiously for the next installment and contenting myself with reading another issue of Marvel’s Star Wars in the meantime. It was a wonderful moment, but as soon as the screen faded to black I realized that something about it felt very off to me. I pondered about that shot for a good chunk of time until I realized I had seen all of this before… because I had a poster of it on my wall. JJ was up to his old tricks… The shot is nothing more than a recreation of that iconic poster, and while it’s a nice nod it really speaks volumes about one of Abrams’ biggest weaknesses, and accentuates a growing concern I’ve had for months. You see, one of the biggest knocks on Abrams has always been his lack of creativity as a filmmaker. He’s always been involved in projects that on some level are derivative of other works. Three of his past four motion pictures have been sequels of franchises, with the one exception, Super 8, being a complete knock off of a 1980’s Steven Spielberg film. Even the TV series he’s produced have borrowed liberally from other works. One of my favorite shows he produced, Alias, is nothing more than one part The Girl From U.N.C.L.E., one part X-Files, with a heavy dose of Dan Brown mythology. When you look at the totality of his work there is really nothing there that screams “visionary,” or even suggests an artist who really has the ability to oversee the relaunch of a massive franchise… just look at his very hit and miss results with Star Trek. Ultimately, his lack of his own creativity is his downfall as a filmmaker. While Lucas could take all of these wildly divergent elements from myth, pop culture, and religion and massage it into it’s own self contained universe which felt original yet familiar. Abrams, on the other hand, has shown no such ability as an filmmaker. His work routinely feels like a homage to another artist’s work, or a series of ideas slapped together in an effort to feel original, but wind up coming across as derivative. This trailer does nothing but reinforce that point as there is no original substance to be found. The one thing I can say about Lucas was he had an ability to tease you with new locales, strange aliens, and situations in each of the five teaser trailers that followed A New Hope. Whether it’s battles in the snow, the forest, a high speed race through the deserts of Tatooine, raging storms over a water planet, or a deadly lightsaber duel on an erupting volcano, Lucas was always able to tantalize with new ideas. JJ’s tease is little more than a complete rehash of the Original Trilogy with a new young trio surrounded by visuals and designs that are all comfortable and familiar. And that leads to my biggest gripe and concern… I’m not convinced this film will be terribly original, and will in fact be little more than a soft reboot of the Saga, allowing Disney to distance itself from George’s Saga, and move forward, and frankly Disney has found the perfect guy for THAT job. While Abrams talks a lot about “moving the Saga forward” I’m not so certain with this trailer that Lucasfilm is really going to attract interest from young audiences. The trailer really caters to older Star Wars fans, and if you are a young person who is not already invested in Star Wars there’s little in this trailer to suggest something new or fresh about the Saga. 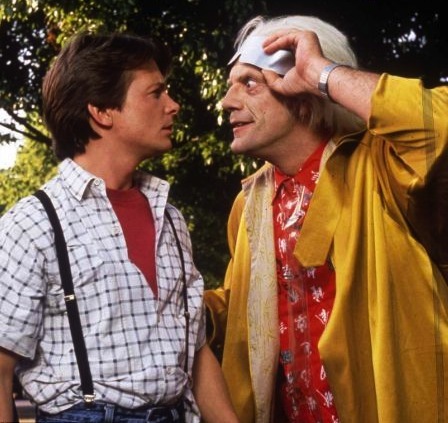 We’re Going Back… To The Past!!! As you can clearly see these are real sets, designed and constructed by a group of talented artists who took weeks, and months to develop designs which could tell the story Lucas was trying to tell. 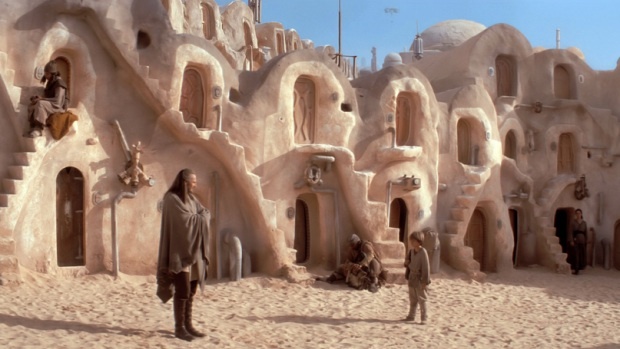 Each one of the Prequel films is filled with beautiful sets and locations, certainly enhanced with special effects, but if you don’t believe J J will be incorporating the same techniques, I’ve got some lovely beach front property in Yuma I can sell you. However, what really grinds my gears is that JJ is so willing to cavalierly dismiss the work on those films, all for the benefit of throwing around a few buzzwords that get fanboy hearts aflutter. I used to work as an intelligence analyst back in the day with a focus on international politics… so words are really, really important to me, and what’s left unsaid, or implied by the words you are using is as important as what you actually say, or what you meant to say. During one portion of the interview section of the show JJ states that the mandate he had was to “set a standard” and that everything had to feel real. That’s a good enough sentiment, but then he takes it a step further; unnecessarily so: “You knew people were in those places. The way the light interacts with the set. You want it to be legitimate, and authentic.” Abrams is clearly separating himself from Lucas here, and is making it clear, although unstated, that he’s going to make a movie for older Star Wars fans who felt burned by the Prequels. To make matters worse he’s actually implying through his words that what George did in Episodes I-III was “inauthentic” and “illegitimate.” As if Lucas totally dismissed the use of practical sets and locations. I think as I’ve shown in the pictures above that was certainly not the case with the Prequels. Also understated in the Force Awakens panel was any mention of Lucas, or even a hint of his involvement in the production. I think George’s name came up a whopping two times in the entire panel, despite the fact Lucas created this large sandbox that all of these people are playing in now. I’m really beginning to suspect that George’s statements from January that Disney had jettisoned his treatments for the Sequel Trilogy and were doing their own thing is true. 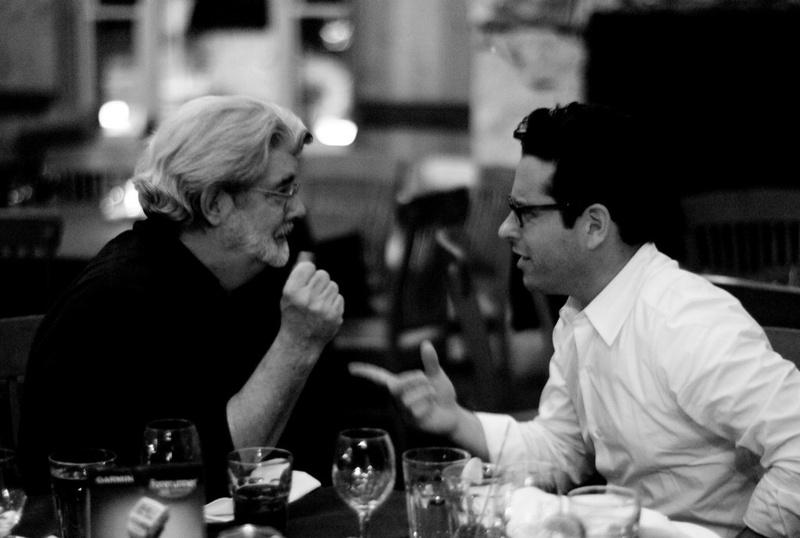 Early on we were told Lucas and Abrams were meeting regularly, and Lucas’ son even suggested that George and JJ were texting daily. 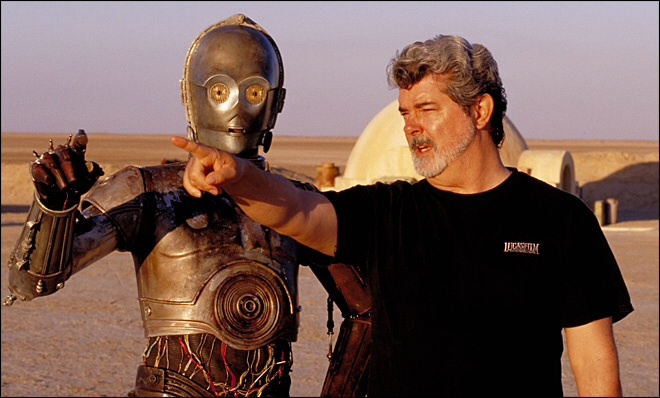 Then Star Wars scribe Michael Arndt, who was writing scripts based on George’s treatments was let go, and then Disney Studios honcho Alan Horn implied in a Q&A that he wasn’t aware of Lucas’ involvement in the project any more. That would certainly explain why Lucas is even barely given a mention at Celebration; even Lucas’ good friend Kathleen Kennedy only mentioned his name in passing while recounting how she became head of Lucasfilm. Frankly, this troubles me a great deal. Much has been made of Abrams ability to weave a mythology in his television shows like Alias and Lost, but in the case of both shows, that mythology became a muddled mess as the shows wore on. Both shows did not find their footing again until AFTER Abrams had left the productions. Add to that his inability to understand the roots of the mythology behind the Star Wars Saga, and there is cause for concern. So excuse me if I have a lot more faith in the guy who actually created the universe, than a sometimes very talented filmmaker (Super 8) who is often prone to make materials that are devoid of real depth and miss the point of the source material (Star Trek Into Darkness). I really want The Force Awakens to be a film that launches fandom for a whole new generation of fans, but from what I’ve seen it looks like I’m stuck in a 1980’s time warp. So, like most fans I’ve watched the new Star Wars: The Force Awakens teaser trailer a few dozen times, and I’ve had a full day to process my thoughts about it. I really enjoy the trailer overall, but there are aspects I’m somewhat ambivalent about. In retrospect, it’s a nice trailer which generates interest in the film, but I didn’t find particularly earth shattering, or game changing as some fans have called it. Frankly I found the teaser trailer for Jurassic World a much better tease and definitely has me hyped to see it opening day. However, there are some really interesting aspects about the trailer I wanted to delve into a little bit closer. So strap yourself in, cause here we go!!! 1. 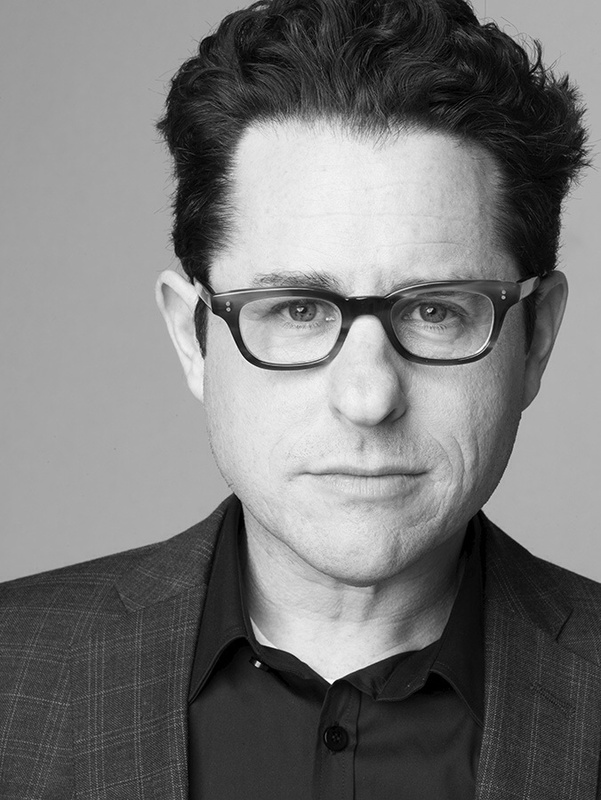 Cinematography: I’ve always been a fan of the look of J.J. Abrams films. Sure, he uses shaky cam from time to time, and the lens flares can be a bit much, but his visual style has always been rooted in a Spielberg look (e.g., Super 8) mixed with some modern techniques (e.g., Alias pilot, Mission Impossible III). I figured he would stick to a visual style more closely resembling what Lucas, Kershner, and Marquand established in the 6 films of the Star Wars Saga, but there were a couple of shots that really stood out like a sore thumb and bothered me quite a bit. 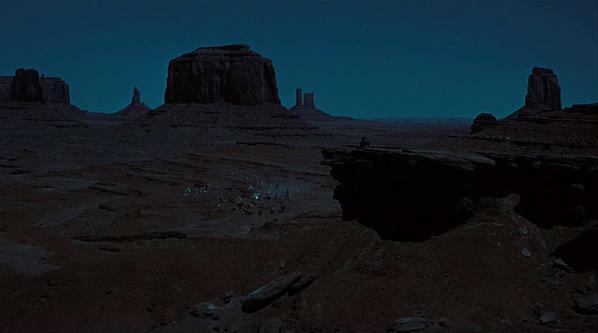 For example, the first shot we see is a desert skyline; fine looks great. Then one of our heroes, played by John Boyega, jumps up into frame… no problem. However, my big problem comes specifically from the lighting of the shot; it is extremely flat, and lacks any depth of field. For a brief moment I thought someone was pulling a fast one and this was a fan made trailer as it looks like a shot someone had taken with their home video camera. It’s ironic that Abrams constructed a shot that is so flat it almost looks like it was shot on video, while both Attack of the Clones and Revenge of the Sith were in fact shot on video and never looked like they were. My other problem comes from the Stormtrooper landing sequence, as Abrams returns to form and makes generous use of shaky cam and a modern blue hue which is commonly found in horror films (he made ample use of this in Super 8). My problem with both of these is they simply do not fit the visual language of the other six films. There’s certainly room for creative interpretation in the Saga. For example, Peter Suschitzky’s camera and lighting work look significantly different than Gil Taylor’s work in A New Hope, or Alec Mills’ in Jedi, but there is still a consistency that looks and feels like the preceding films in the Saga. However, this is a fairly drastic change. One could argue that the films need a different look for a different time, and that’s true to a point, but when the films are numerical and are chapters of a continuing story, there should be an effort made to keep the look and style consistent. If you want to hire Paul Greengrass to make a total shaky cam, documentary film about Clone Commandos in a spin off film, then fine. The spin offs are certainly an arena where directors should be allowed stretch and see what they can do with the Star Wars genre, but I firmly believe the “Skywalker Saga” should have a consistent approach. Again, there’s room to explore, and the remaining shots in the trailer look like they came from a traditional Star Wars film, so it may just be this one sequence. 2. Ball Droid: I love ball droid, or ME-551 as I call him (HINT: change the 5’s into the letter they look like… you’re welcome futbol fan). He’s adorable, cute, and strange like a lot of Star Wars characters. 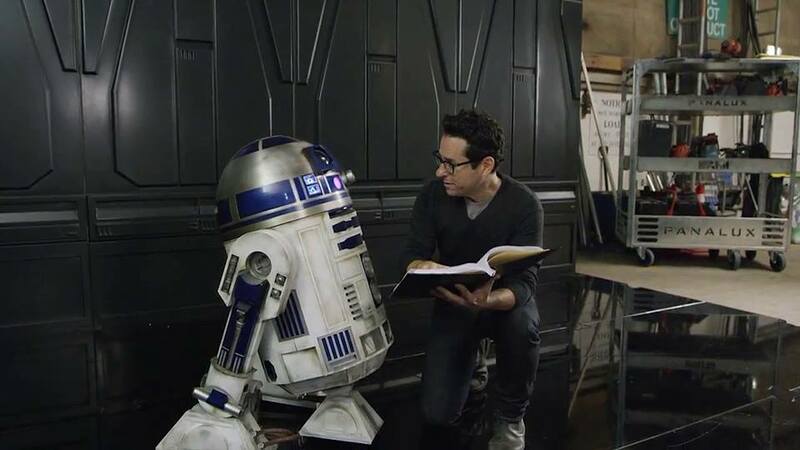 I found it extremely amusing that a lot of “fans” who have bemoaned George Lucas adding cute or childish elements to the Saga, had no problem with this droid. He’s literally a soccer ball with a mini R2 dome attached, and makes all the cute little beeps, moans, and whistles that we’ve grown accustomed to from droids. Of course some of these fans argued that cute wasn’t part of Star Wars before Jedi and those insufferable Ewoks. I guess I must have been imagining things when I saw mouse droid in A New Hope, the little bat guy squeal for his drink in the cantina, or watched Chewie cower in fear like a dog after escaping the garbage masher and hear the screams of the Dianoga. 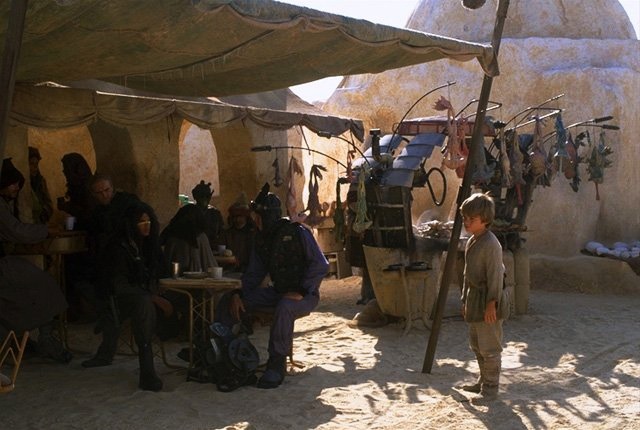 Those scenes all struck me as “cute.” But what about the fart and poo jokes in Phantom Menace, Yancy? Well we had belch jokes in both Empire and Jedi, and a cute little fight scene between a little droid and an annoying diminutive green Muppet; so excuse me if I’m not offended by more childish humor in my Star Wars films. Get over it; cute has always been a part of Star Wars. 3. Daisy Ridley: I know almost nothing about this character, besides what I’ve read on various spoiler sites, but I love the design of her clothing, her speeder bike, and I love Ridley’s determined look in her brief moment on the screen. I know I’m going to love Kira (or whatever her name turns out to be), and despite what some rumors are reporting, I have a suspicion she’s Han and Leia’s kid. She has that same kind of feisty Leia Organa/Padme Amidala vibe to her, and I cannot wait to see Ridley’s performance on the big screen. The other big stand out moment during this sequence was the reveal of her speeder bike. It has a great lived in universe look, and feels like something you might find in Mose Eisley, or racing down the streets of Mos Espa (from Episode 1). It’s a terrific design that looks like one part souped up speeder bike, and one part Magnum Ice Cream bar. I really like the look and feel of this entire sequence. Our Dark Side villain moves in a very stealthy yet aggressive manner as if he were hunting prey. In a very dynamic shot we follow him/her through a snowy forest, when suddenly the lightsaber is ignited. It’s a very cool moment that works especially well with the dire sounding narration. The look of the saber is cool, but I will have to agree with critics that it appears to be fairly impractical. So we heard a lot of hoopla going into this production that the new Star Wars film was going to be made using “old school” techniques, with less CGI. 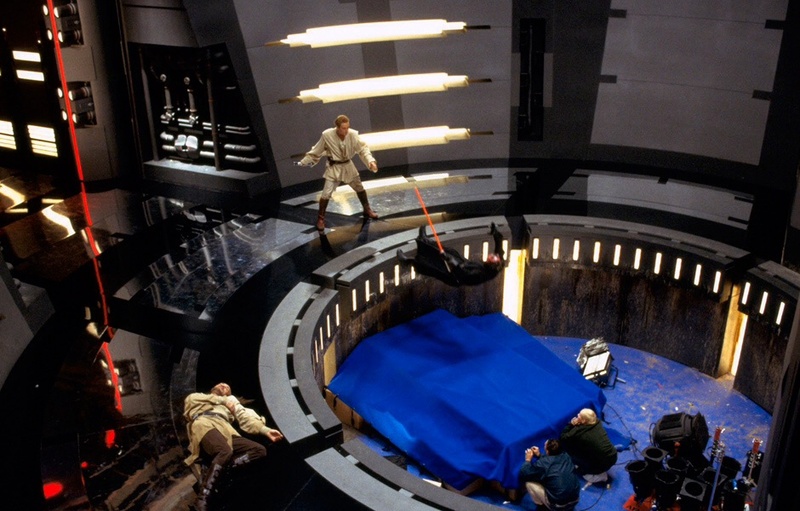 Practical sets and miniatures were the new norm (as if the Prequels didn’t use these), and the film might even use stop motion in one scene. Older fans were all aflutter as they apparently believed that the page was being turned on the CGI-fest of the Prequel Trilogy era, and we were entering a new phase where model makers were going to lovingly craft models (which they did for the Prequels by the way), and use motion control cameras to create shots in camera (they did this in the PTs too) in front of a green screen. 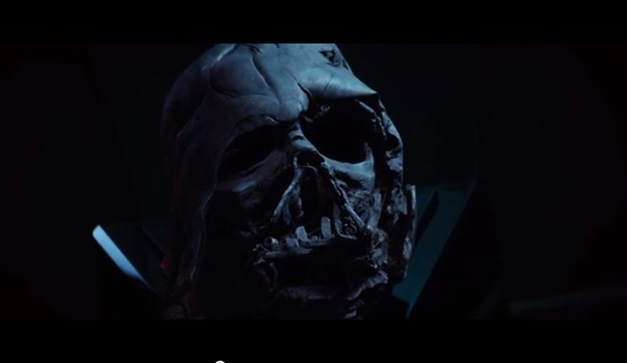 Well the trailer unveils, and what do you know… CGI everywhere. Ball droid.. yup CGI. Beautiful X-Wing fighter shot… most of that was constructed in a computer. The glorious, over the top Millennium Falcon flyby… yup, that’s CGI too. Obviously a model of the Falcon was used, but it was (like most of the PT models) scanned and turned into a computer model enabling FX artists to create much more complex and elaborate effects shots than was possible before. If any fan honestly believed they were going totally “old school” and would not use the tools available to effects artists today, then you were dreaming. Industrial Light and Magic is going to use every tool and technique at their disposal whether it’s “old school” or newer CG advances. Lucasfilm is banking everything on this film, and will leave nothing to chance. Overview: Reflecting on the trailer after 24 hours has not really changed my opinion. 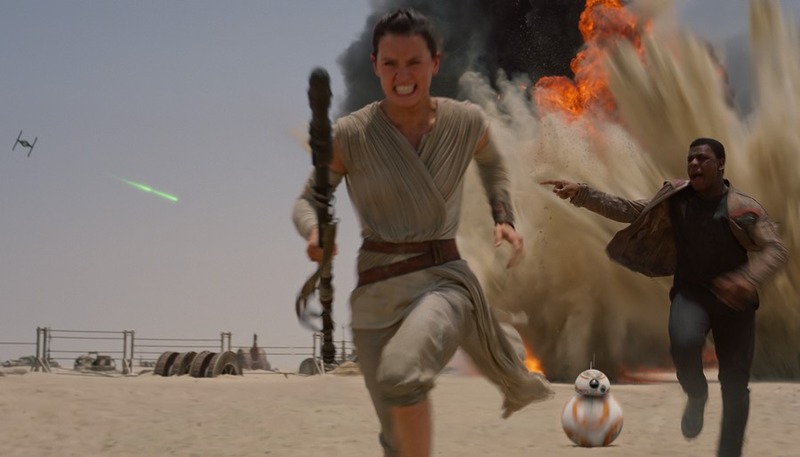 The Force Awakens is a solid teaser trailer, but I would hesitate to call it spectacular. There are some terrific moments, but there are also areas that raise concerns for me. To me this trailer feels more like a preview of a teser, almost like the web exclusive “Breathing” teaser for Attack of the Clones. Hopefully, by the time we get to Celebration a proper teaser will be unveiled that will give us more to sink our teeth into. 1. LOVED, LOVED, LOVED the shot of the X-Wings skimming over the water, looked fantastic, and suitably epic! 2. Nice to see the Falcon again, not necessarily sure I’m a big fan of that particular shot. A little too much shaky cam for my taste. 3. Speaking of shaky cam, just looking at the Stormtrooper landing sequence it is VERY evident this is a J.J. Abrams film, and will look very modern compared to the other six films. This isn’t necessarily a bad thing as fans need to remember these films are being made for a younger audience and there are certain expectations they have. 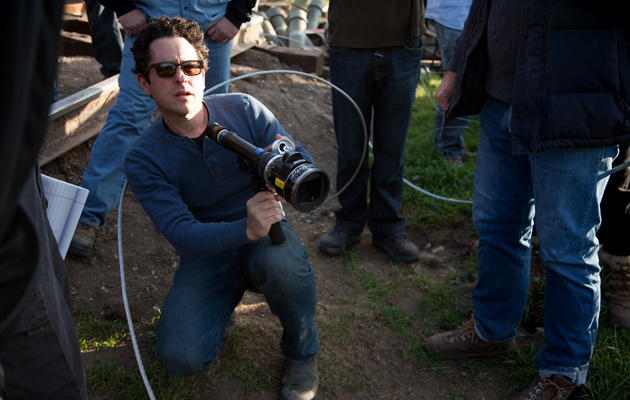 Abrams like to use shaky cam to give the audience a “you are there” feel. I’m sure he will dial it back compared to Mission Impossible III, but he’s not going to change the way he makes films. 4. Bad guy’s lighsaber… jury is still out for me. I’m not sure if I’m a big fan of cross guards on the hilt of the lightsaber blades as they seem unwieldy, but it is growing on me. 5. Rollerball R2 unit. I suspect older fans who hate “cute” elements in their Star Wars are going to hate this character. 6. John Boyega OWNS the screen in the few seconds he appears. I definitely wanted to know more about him. Overall it’s a solid teaser, but I was left a little underwhelmed. Compared to the Episode I & III teasers it was lacking. The Episode II “Breathing” teaser was outstanding, and Empire’s teaser had me going back to the theater again, and again. One of my biggest takeaways from this teaser is that J.J. is desperately trying to surround this film with an air of mystery, but this trailer comes across as less of a mystery and more like a series of random shots strung together that tell us little. The great thing about the teasers for the Prequels is that they hinted at just enough of a story to give the audience a tease of the upcoming adventure, but still managed to shroud it in mystery. J.J.’s Mystery Box can be frustrating at times. On the other hand, I do appreciate the fact that J.J. avoided turning the teaser into a nostalgia fest, and instead of dwelling on the past chose to introduced the new characters that will propel the Saga going forward. 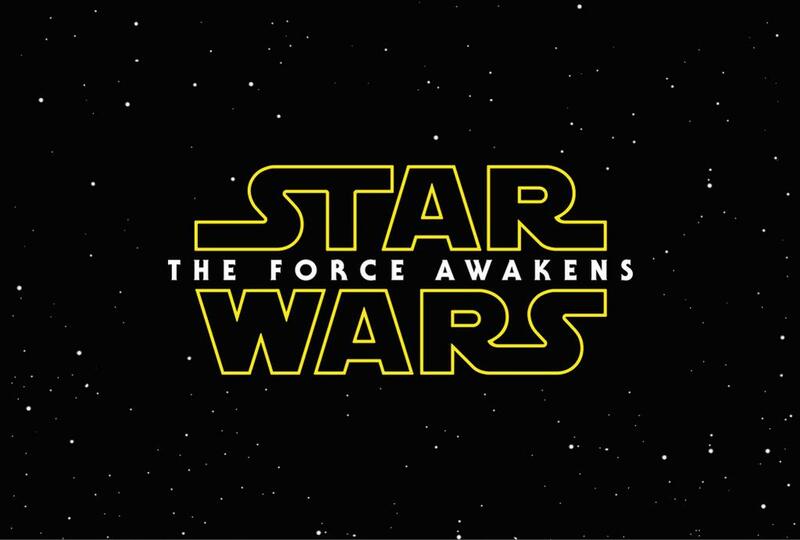 Star Wars VII… really??? That’s it??? Unfortunately the title evokes nothing more than a yawn from me. Gone are the Saturday morning serial inspired titles like: The Empire Strikes Back, Revenge of the Sith, Attack of the Clones. Unfortunately this sound more like a spin off novel, or video game. It’s very passive, and not terribly original. Stay tuned for my review of Star Wars Rebels: Out of Darkness later today. Star Wars Rebels Season 2 Trailer!